WHEELING — Baltimore Orioles legend Earl Weaver once said that the key to winning baseball games is pitching, fundamentals and three-run homers. Wheeling Park provided all three on Wednesday as it rallied for a 7-5 victory over Steubenville at Patriot Field. Big Red held a 3-0 advantage in the fourth when Patriots’ shortstop Trevor Thomas stepped up to the dish and crushed a game-tying three-run homer. That missile over the left field fence got the rest of the lineup rolling as Park added three more runs in the frame and an insurance run in the fifth to capture the victory. Thomas added a RBI single in the fifth and finished the game with four RBI. After collecting just one hit as a team through three innings, Park’s Zach Kahle and Jacob Shia led off the fourth with back-to-back singles to set the table for Thomas. Thomas wasn’t looking to do too much in the at-bat but his smooth swing resulted in his first career home run. Along with the three-run jolt, Wheeling Park played solid defense and received strong outings on the hill from Jarrod Jones, Ben Taylor and Thomas. Jones escaped jams early by striking out the last batter of the first two innings with runners on third base. Thomas also fanned a hitter with runners on second and third in the sixth. “I’ll take a game like this and the pitching effort we had,” McLeod said. “We had first pitch strikes and not many walks. We have guys who can play defense but they can’t defend walks. On Tuesday, we walked 10 and that is unacceptable at Wheeling Park High School. Big Red stranded seven runners on base in the contest, which also proved to be a difference in the outcome. Steubenville struck first in the third inning as a leadoff walk and a single from Alec Taylor put runners on the corner with no outs. Johnny Agresta delivered a RBI sacrifice fly and Ryan Neely garnered a RBI double for the 2-0 edge. Neely eventually scored on a past ball to extend the lead to 3-0. After Thomas’ blast in the fourth, Brett Donohew supplied a two-run single to right field to give the Patriots the lead for good. A groundout by Nolan Mattern plated William Pelley to provide Park with a 6-3 advantage. The final two runs for Steubenville scored via error and a solo home run in the seventh by catcher Clayton Criss. Jones, Ben Taylor and Thomas combined for seven strikeouts on the mound with Taylor earning the victory. 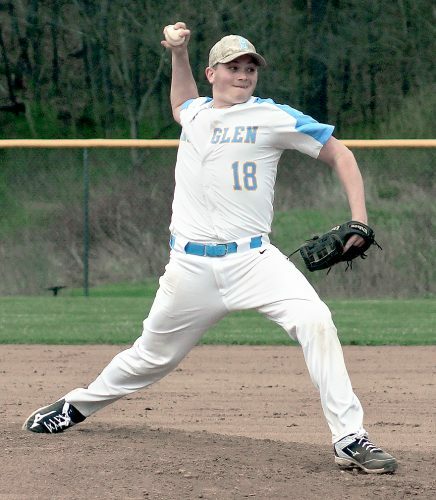 Alec Taylor finished with two hits for Steubenville, while Jacob Shia doubled and singled for Park and teammate Ben Taylor recorded a pair of hits. “One thing about this team is that we continue to battle back,” McLeod said. “I challenged them. The last couple of games we were not playing how we usually do. I told them we are running out of opportunities to get games in before sectionals. “I said to try to play the perfect game. If you try to be the perfect player, the team will be the perfect team. There is a lot of fight, scratch and battle in us and that’s what I love about our team. S: Kausky lp (0SO, 2W), Duggan (4) (0SO, 0W) and Criss. Criss HR, D, rbi; Taylor 2S; Agresta S, rbi; Neely D, S, rbi. W: Jones (3SO, 1W), Taylor wp (2SO, 0W), Thomas (6) (2SO, 0W) and Mattern. Shia D, S; Thomas HR, S, 4rbi; Taylor 2S; Donohew S, 2rbi; Mattern rbi.